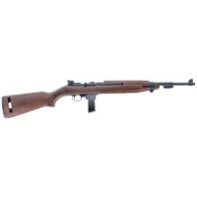 Modeled after one of America’s great military arms, the USGI M1 Carbine, the M1-9 is nostalgic, fun and practical. This handy, easy to shoot rifle has the same overall dimensions, trigger groups design and sights as the original, but is chambered in the affordable and readily available 9mm Luger. The receiver has a dovetail machined on top of the front and rear receiver rings. The straight blowback design makes the M1-9 ultra-reliable and easy to clean and maintain. Cartridges are fed from standard Beretta® 92 style magazines with two 10 round magazines included with each M1-9.